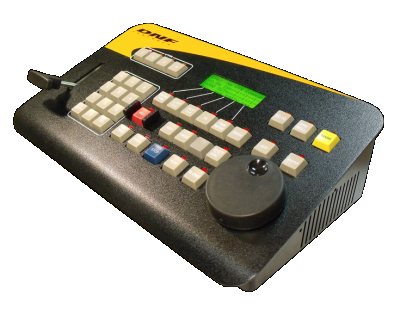 Designed for demanding, fast action sports broadcasts, the acclaimed ST300-T Slow Motion Controller provides fast, simple, precise control of four VTR’s/DDR’s. Its highly personalized control features provide operators the speed and simplicity necessary for fast, accurate replays. This controller offers a mechanical detented jog/shuttle wheel for easy control and also features a T-bar for fast, simple, and smooth slow motion instant replay. Powerful setup menu for personalized control features: lets you configure the ST300 Slow Motion Controller for the way you work. Select Wheel slomo speed range, automatic Mark Cue advance, save last used slomo speed, enable/disable Freeze at Record Out and more.